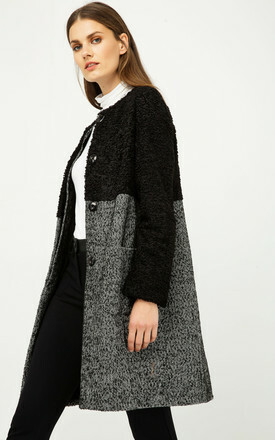 Long sleeve coat with a round neckline. Astrakhan style fabric at the top and black and white coat fabric below. Fastens in the front with a big round black button and concealed slightly smaller buttons. Drop shoulders. Two pockets at the sides. Fully lined. Straight silhouette with a moderately oversized fit. Length for size 38: 95cm. Our model is 178cm and is wearing size 36. Our model is 178cm and is wearing size 36.